Australia begins production of potash. It is a large consumer of the salt, but until now has not produced any of its own. Though resources of the compound have always been available to Australian companies they have never processed it. The Australian Potash company has obtained 3 tonnes of potassium-rich feeder salts from the Lake Wells SOP (sulphate of potash) project. The process facility is near Perth. Production of more of it will be carried out over the next three months. Two Chinese MuO off-take partners have joined the parent company. Lake Wells 180km from Laverton is the source of the compound. There is a chain of evaporative ponds that filter it out of raw material. A research project has been set up by Australian Potash with the School of Agriculture and Environment at the University of Western Australia. The newly produced Australian potash will be tested on various WA soil types. The university product will enable the company to engage with the consumer, namely, Australian farmers. In the first five years, it has a target production of 150,000 tonnes per year of premium SOP. From then on it will be 300,000 tonnes per annum. news comes ahead Perth-based company’s plans produce Australia’s first field evaporated SOP, Mr Shackleton said would prove valuable its offtake partners.company focused developing operation Lake Wells produce high-value fertiliser cost promotes SOP muriate potash fertiliser.company’s Lake Wells project has advantage being close rail port infrastructure, local government support planned low-risk brine abstraction model, expected bring operating costs. 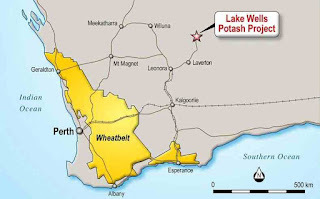 Australian Potash currently undertaking definitive feasibility study development Lake Wells potash project following completion scoping study early 2017. At initial 150,000 tonne annum output, scoping study put $160 million price tag operation. Government support, Earlier month, WA government made good its plans assist development local potash minerals sector, announcing would reduce potash rental rates.decision means potash projects granted new class mining lease restricted minerals pay 2. hectare first five years lease $4.64pha year six onwards.